Guinea pigs are great pets, they are inquisitive and social, are very well mannered, and live around 5-6 years of age (though some can get as old as 8 years!). They originate from South America, and they are found in four different types of coats: Peruvian (long-haired), Abyssinian (with coats in whorls, rougher coat), Smooth coated, or hairless (a.k.a. skinny pigs). Male guinea pigs are called boars, with females called sows, just like real pigs. They make many different types of noises, including short chirps and ‘wheeks’ to get your attention or ask for food, to purring noises, something like a cat would make. Check out the Metropolitan Guinea Pig Rescue’s website for various guinea pig sounds. Nutrition is extremely important with guinea pigs. They need to eat large amounts of hay every day, with Timothy hay being the most recommended type. The hay helps to keep their teeth ground down to a normal level. If they don’t get enough hay, their molars can easily overgrow. Vitamin C is also very important for guinea pigs, they need a daily source of this important vitamin (such as the Oxbow Vitamin C tablet). They can also eat vegetables in their diet, with certain types being recommended more than others. For example, iceberg lettuce isn’t recommended, since it is too high in water content and guinea pigs can get diarrhea from this type of lettuce. Guinea pigs need a large amount of floor space to keep them comfortable. While guinea pigs aren’t avid jumpers, having a cage with walls high enough to avoid escape is important (>10 inches). They can easily get hurt from jumping from a high height, it is best that if they have a second floor to their cage, that it (and the ramp) is enclosed to protect them from injury. The most commonly used caging for guinea pigs is called a C&C (Cube and Coroplast) cage. Having several areas in the cage to hide, such as an igloo, or a box is helpful, since they like their privacy. The cage needs to be changed daily, since they are prolific at urination and defecation. Bedding can either consist of shredded paper products or pellets, aspen shavings, or towels/blankets. Do not use pine or cedar shavings, since they have aromatic oils that can predispose to respiratory and skin diseases. Guinea pigs are indoor pets, they prefer temperatures between 65-80⁰F (18-26⁰C) for comfort. Ensure there is plenty of water available. They typically prefer a water bottle, but some guinea pigs will only drink out of a heavy dish on the ground. If you are using a bowl, ensure to clean this water several times daily, it will get dirty very quickly. Guinea pigs can be skittish, and it takes them time to get used to handling. Bringing them out for play at least once daily can help get them used to being held. To hold a guinea pig, pick them up with a hand under their belly/chest, and one hand under their rump. Hold them on your chest, with one hand under the rump, one on their back to prevent jumping. Guinea pig nails can get very long, curling around themselves. Nails should be trimmed about once every month. Just like with dogs and cats, you want to avoid cutting the blood vessel in the nail. If you aren’t sure where this is, you’re always welcome to have your veterinarian or a veterinary technician demonstrate how to best hold your guinea pig, and how to trim the nails safely. 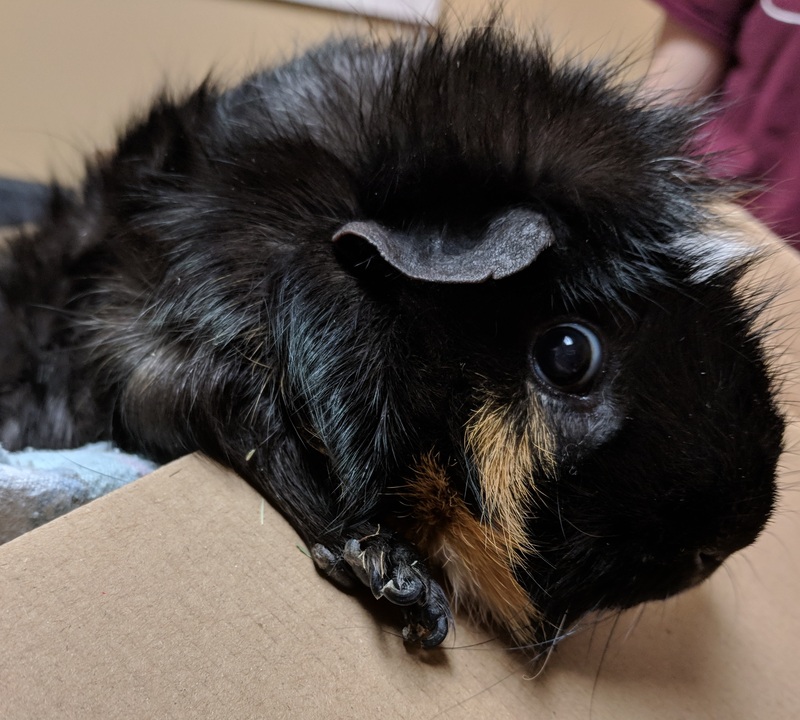 When should I bring my guinea pig to the vet? If your guinea pig’s appetite reduces or they are putting out less feces than normal, they should be seen by a veterinarian. With a guinea pig’s digestive system, they need to continually eat to keep themselves healthy. A reduction in appetite is a medical emergency. Otherwise, guinea pigs can develop other health issues just as any other species, such as a runny nose, or blood in the urine. Proper nutrition and housing can prevent a lot of health problems. Weighing your guinea pig weekly will help to monitor their condition as well.